The Lyons Share: Go ahead and JUMP! I found a unicorn on my lunch break! 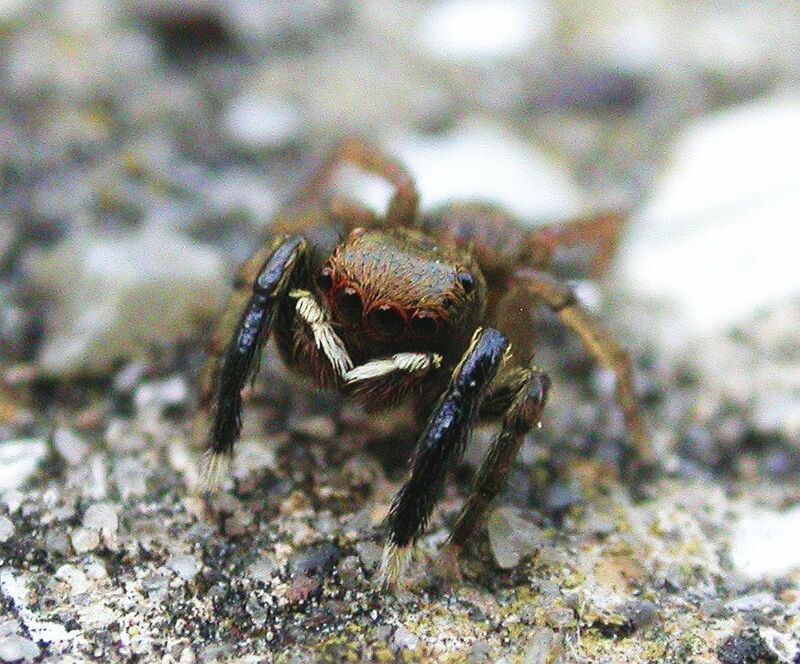 Jumping spiders are awesome, So awesome in fact that this article can only be read by listening to Van Halen. 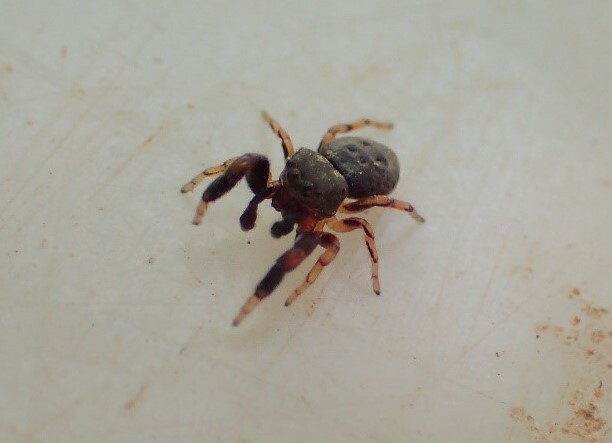 All jumping spiders permanently have this on on their headphones. 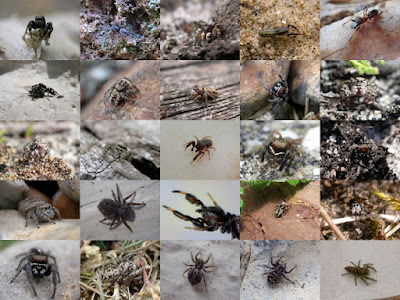 There is however one massive problem with jumping spiders: there are not enough of them. If you count the three accidental species, there are 42 on the list, if not it's just 39. I have been lucky enough to see 28 of these 42 species so far, I'm running out of them! Our biggest jumper is pretty easy to pick up from casual observations on gate posts, so that's probably why it's my most recorded jumper (despite being scarce it's common in the south east). It's also easy to find when looking for deadwood beetles. I don't have a photo of this diminutive species but it seems to be ubiquitous in moss and is really easy to find with the suction sampler. The familiar synathropic species doesn't turn up that much on surveys on nature reserves but does well for casual recording around towns and semi-urban sites. This little jumper is actually a member of the magic circle, having two magic wands grafted on to where it's front legs should be. Looking at its eyes it also has severe hay fever. Very common, especially in litter piles etc. This mainly heathland specialist is clearly well represented in my records for all the surveys I have done on heathlands. This is a stonking jumper, the adult males look like miniature Gorillas with added war paint. And legs. Female above, male below. OK, I know this will make me unpopular but if we have our favourites, we should also have our least favourites. I don't really like Heliophanus. We have two mega common species that are not always easy to do in the field. Neither is scarce and neither really tells me anything about the habitat. And I have no photos of either. The fluorescent yellow palps in the female are purchased from Cyberdog. There are two other rare and restricted species I am yet to see. Phwoar!!! This on the other hand, is a smart spider. I am a sucker for a contrastingly tri-coloured invertebrate. The proportions are so pleasing too. Imagine having one of these the size of a Staffordshire Bull Terrier. You'd get some looks going to the shops! I don't see this as much as arcuata despite that having cons status and this not. This species is pretty easy to find by beating foliage of trees and bushes in the summer. I tend to record the female more than the male. Here is the only shot I could find of an adult male. It looks like Sibianor aurocinctus but I have only ever found that in grassland. That one is coming. I love this guy's front legs and 'upholstered' abdomen. 9) Heliophanus cupreus - 24 records. Meh. The other species in the genus. I can't believe that this has made it into the top ten. I only recorded my first one in May 2016 at Levin Down. I could blame this on the purchase of my suction sampler but I think it's going through a genuine increase as most of my records are from the sweep net. Although most have been on chalk, I have picked them up on neutral and slightly acid grassland and sometimes not even particularity good grassland. If you think Ballus's legs are cool, you ain't seen nothing yet. Get a load of this. The first of the shingle specialists and perhaps the most widespread of those in Sussex. Male first, then the female. Expect inexpectus on shingle. I have no photos of this tiny little beast. I usually pick it up in the suction sampler on the chalk and at coastal sites etc. 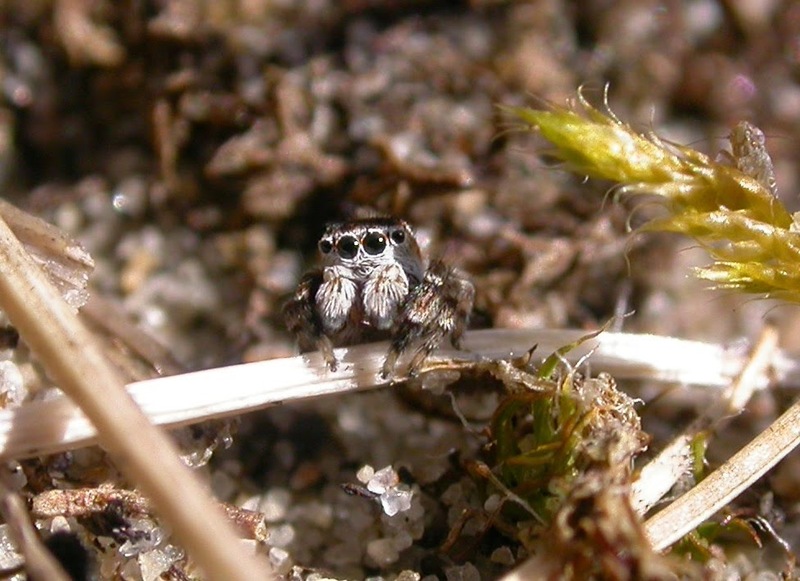 I have no photos of this little jumper either, known as the Whelk-shell Jumper (as it's on the BAP list). I have only seen it on vegetated shingle on the Cuckmere. OMG. I love this spider. It's definitely my favourite. Proportionally very square, almost cuboidal. In Sussex, it's only ever been found at Iping Common and Ambersham Common and needs early successional habitat to thrive. Male (above) has creamy, dreamy palps. Intense green eyes, head-chevrons and a big fat white stripe down the black abdomen. Everything you could ever want from a jumping spider. I think of this as being the thinner, paler, more arboreal/rural version of the common Salticus scenicus. The rarest of the three species and usually found on pines or beaten from big old oaks with dead branches etc. Don't bother looking for this spider, it will find you. Usually when you are not expecting it and always around houses. Probably at a time you don't have a notebook on you so don't forget to record it! I have only ever seen this ant mimic at the Crumbles where it is abundant in Pampas Grass tussocks. You can now also find this spider at Rye Harbour. All my records come from a single site on a single day, Climping Dunes in West Sussex. This is a TINY jumper. Does some really funky dancing up and down fallen Marram Grass stems. With a proportionally large 'head', the cute factor is turned up to 11. Not a scarce species but one I hardly ever see. I think all my records come from the classroom wall at Woods Mill! I have been shown this by Andy Phillips and Chris Bentley at Rye Harbour but I have no photos of this tiny and rare shingle specialist. 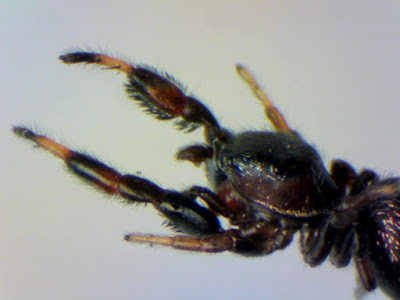 If Adam Ant (then not now) was a jumping spider, he would probably look like this. This is one of the smartest looking organisms I have ever seen. It's my second favourite jumper. Mega rare and only found at Rye Harbour and a few other shingle sites nationally. It's big an' all. I picked this up on scrape at Iping that had been put in for Heath Tiger Beetles. It was the first record there in some 45 years. They're still on that scrape. It's a tiny but insanely bright jumper and a very active one too. The photo doesn't do it justice. The orange-red colour is intense. This is out of date actually as I have had it in Sussex now at the Crumbles. A big smart spider (this is the female). Found by beating pines in urban settings. Found in Marram Grass litter, I have only ever seen it at Camber Sands in East Sussex. This is the only native spider here that does not occur in Sussex! I have only ever seen this once sieving fen litter at Chippenham Fen. Another coastal specialist that I have never managed to photograph. A really smart chunky spider, the female like a humbug. An introduced species that I have seen once in a hot house in Surrey. OK, that ended up being longer than I thought. Well done if you got the end. Now jump to it and get out there recording jumping spiders! 3 Response to "Go ahead and JUMP!" These are way cooler than Van Halen surely!? House of Pain ‘Jump Around’ more likely the sound for these guys. Thanks for the comments guys. I beg to differ Skev, it's cool because it's so not cool. And spiders are definitely the stadium rockers of the arachnid world.